BlogHer ’12- Oh the Places You Should Go! If you’re a blogger planning to drop in on the greatest city on Earth for the greatest blogging conference on Earth (aka BlogHer), or if you’re an eager visitor gracing this city for a short while- then this is a list for you. While quintessential tourist stops are fun and kitschy, they can be a bit overwhelming (or underwhelming, depending on how you see it) and you can actually miss a lot of what makes this city so darn great and memorable. Here’s a list of places, that as an experienced New Yorker, I would recommend to any out of towner looking to get a taste of the big apple. Central Park– This is both a tourist attraction and treasured New York favorite- and with good reason. Central park is one of those places you can spend hours upon hours wandering around in and taking photo’s. If you decide to go in August, make sure you’re wearing comfortable shoes and bring plenty of water. Chinatown-Chinatown has great restaurants each with its one specialty, take the six train to Canal St. and stop by local haunts like the New Green Bo. Their shrimp dumplings are amazing, they also offer great vegetarian dumplings- in a word… yum. Next door are truly authentic steamed pork buns where people line up to take home a fresh batch of these lovelies, if you never had one go in and try one you’ll be glad you did. Feel free to wander around Chinatown, just keep your GPS enabled device with you, or ask a local or store worker for directions out. St. Marks Place (The East Village)- The East Village used to be crazy, wild, and dangerous – with St. Marks at its heart- way back, back, back in the day. Having been gentrified since then, the village is full of hispters and cool places to eat, with NYU dominating the Union Square area. St.Marks is a great place to take a glimpse back into what was, you can get $1 pizza, egg creams, frozen yogurt, and killer $2 falafel. 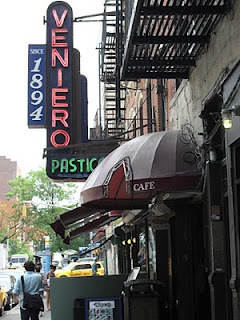 A few blocks away is insanely yummy old-school Italian bakery- Veniero’s. 34th Street– If you’re looking to shop 34th street is where you want to be. Take a picture in front of Macy’s famous windows, then head down their ancient wooden escalator to the cellar and pick up one of my fav. Macy’s treats- a slice of chocolate chip cheesecake. My favorite 34th street stop is Jacks 99 cents store- they’ve always got amazing deals on great products (don’t forget to head up to the third floor). Little Italy– I remember being in elementary school and every other week my mom and dad would take me and my sister down to Chinatown. After a meal filled with dumplings, general tso’s chicken, chicken and broccoli, lo mien, the obligatory tea pot, and a handful of fortune cookies, we would walk from Chinatown into Little Italy. There’s something enchanting about NYC’s tiny piece of Italy (besides the Bronx’s Arthur Ave.), that’s always brought me back here. Anyways, after our meal we would head to Ferrara’s on Grand Street (btw. Mott and Mulberry Street) where my dad would buy my mom, my sister, and I some unforgettable tiramasu. Don’t leave NYC without stopping by here! Do you plan or have you gone to any of these places? Going to BlogHer ’12? Let me know in the comments! Any recommendations or questions??? Let me know those too! Also, if I was planning a guided tour around these locations the day before BlogHer, how many of you would be interested??? Let me know! Next Post Taste of the Tropics! My May Cravebox Review! Where can I get more information on BlogHer? I’ve heard of it, but had never looked into going, but if it’s in NYC, I might look into it, as I’ve been wanting to go there since I have never been. Thanks for the great tips on places to see! It’s a massive blogging conference (for the seasoned and newbies alike), here’s a link- if you want you can always consider buying an expo hall and party pass, which is cheaper but doesn’t include the sessions. Thanks so much for stopping by! How does one get into Blogher? I looked and they said they are not accepting new applicants with coupon blogs right now. Fantastic suggestions. I’ve been to Little Italy and was lucky enough to stay at the Empire Hotel across from Central park earlier this month. Unfortunately, it was a very short trip and I little time to explore. I’m taking a few extra days for my Blogher trip and will do my best to hit everything on this list! Thanks! Nice to “meet” another blogger headed to BlogHer 12! It’s great to get all these tips from a true local. I blog about things made in America and am planning on checking out the Garment District while I’m in NYC. How hard will it be to get there from where BlogHer is? Really easy! Do you have a particular address (that way I can give you best tried-n-true directions)? The great thing about the city is that everything is a 30 min or less bus/train ride away- plus, BlogHer has a really great central location! 🙂 Can’t wait to meet you IRL!! !